Integrity ~ What it means. 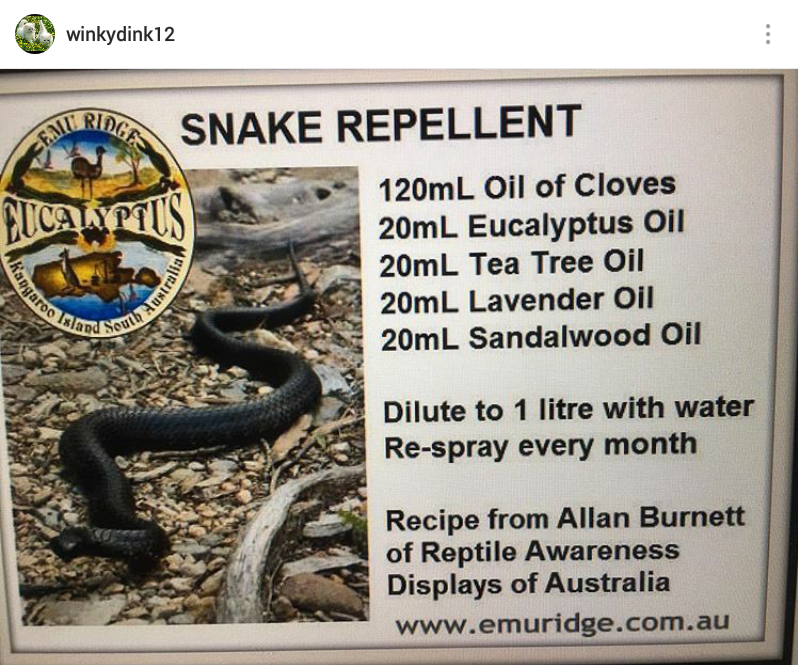 In countries like Australia where there are many snakes, you may need a snake repellent. Here is one method as found on Instagram. Using a search engine you will come across other suggestions and we have posted two below. If you are forced to live out in the wild for a while, you may feel it is necessary to carry a repellent in your back pack. How Do You Keep Away Snakes? 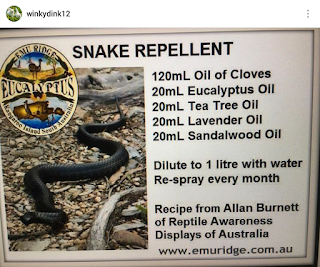 Option 1 - You can purchase and apply a snake repellent powder, sprinkle, spray, or noise device. But although these are sold, they are completely ineffective, and a waste of time and money. Option 2 - You can purchase a snake trap. These work, but they won't always catch the snake. Option 3 - You can hire a professional in your area. Look on the internet for a company, or your local yellow pages, or you can find someone in your town from my directory that I list on this website. This method is the most reliable, but the priciest. Option 4 - You can make your property less attractive to snakes, by clearing out debris, keeping bushes and plants trimmed back, filling in any gaps under concrete or rocks (snakes LOVE these areas), sealing any holes in your house or gaps under your doors, which snakes can enter the house via, or in extreme measures, you can install a fence around the perimeter of your property - a solid fence, not a chain link fence of course. Snakes are beautifully frightening, yet they are gentle creatures. Trying natural repellents is the way to go. Place cinnamon sticks strategically on window seals and near doors. Place peeled garlic cloves strategically on window seals and near doors. Mix 50 drops of cinnamon or clove essential oil with 3 cups of water. Spray around the foundation of you home home. Spray in garages and around foundation of the home to keep snakes away. The strong smell of clove and cinnamon oil deters snakes. Note: You can spray pure clove oil on a snake to make it vacate the area. Be very careful when trying to do this. Trim tall grass. Remove dead leaves, move woodpiles and dry branches. Copyright 2012-2016 © Source4Good Weblog All Rights Reserved. Simple theme. Powered by Blogger.